Cleave's stories are all so emotionally eviscerating, so I was on my guard to read one set mainly during the London Blitz and the Siege of Malta. What makes his novels so unique, is their raw, visceral, emotional gut-punch material and, notably: a huge guilty secret. I think that might have set myself up to not have those expectations met. I kept waiting for some terrible undisclosed plot point to be revealed about one of the characters and that never really happened. Which was my bad, really. This was much more nuanced stuff: lovely, yet unpretentious, it's a stark and vivid story of how war transforms people. Knowing that his grandparents love letters inspired the story is just so wonderful. And there were certainly those telltale Cleave scenes of raw, visceral emotion. Once Mary becomes an ambulance driver in London, there are some episodes that are very difficult to read and one where she faces her own death that is written in the most harrowing way. And after reading this book, I feel as if I, too, have been to Malta during the siege. Alistair's time there is so real you can taste it, and there, too, are some unforgettably written scenes - one that reminded me of Little Bee, in a way. At first it was difficult to emotionally attach to Mary, ostensibly the main character. She starts off as aloof and naive, and goes on quite a difficult journey - coming of age during WWII. It was slightly easier to identify with Alistair from the beginning, and his trials as he goes off to war. But I think that is probably by design, and somewhere along the way I fell a little bit in love with her as her motivations change. "When the hour had come for the war to take him away, that had been the first and last moment she had known without doubt that she loved him. One knew how one felt only when things ended." 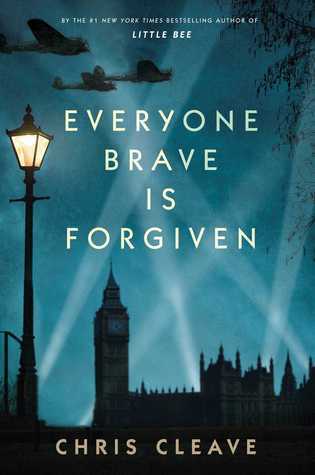 Everyone Brave is Forgiven is available on May 3rd and I would definitely recommend checking it out!